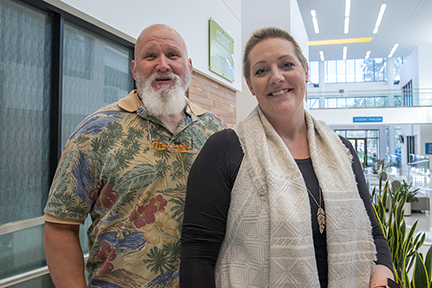 Brazosport College employees Dr. Barry Foster and Jessica Tomlinson were recently honored by the college’s students, faculty and staff as representatives for the League for Innovation in Community Colleges 2018-19 John & Suanne Roueche Staff and Faculty Excellence awards. Tomlinson, a financial aid senior administrative office specialist, was selected for the John & Suanne Roueche Staff Excellence Award, while Foster, a Learning Frameworks assistant professor, was the recipient of the John & Suanne Roueche Teaching Excellence Award. As the 2018 teaching excellence recipient, Foster also becomes BC’s Minnie Stevens Piper Professor Award nominee. Tomlinson recently celebrated her 10-year anniversary at Brazosport College, working all of those years out of the financial aid office. Born and raised in Canada, she graduated from Lambton College in Sarnia, Ontario, with an Associate degree in Office Administration. She moved to Texas in 2007. As for Foster, he earned a Master of Divinity and a Doctor of Education from New Orleans Baptist Theological Seminary and has been teaching at Brazosport College since 2009. He teaches the Psyc1300 Learning Frameworks course and has been active in many campus activities, including scholarship fund raising, intramurals, student life and the newly-created Bikes for Students program. “Receiving this award has been an amazing surprise,” Foster said. “These past 18 months have brought many challenges and the proverbial emotional roller coaster has been running full tilt. Throwing myself more ardently into the work matrix has been a helpful distraction. The John & Suanne Roueche Faculty and Staff Excellence Awards celebrate outstanding contributions and leadership by community college staff and faculty. Each academic year, member colleges are invited to select and submit names of individuals to be recognized as recipients of these prestigious awards. For more information about the League for Innovation in Community Colleges John & Suanne Roueche Faculty and Staff Excellence Awards, visit its Web site at www.league.org. To learn more about Brazosport College, go online to www.brazosport.edu or call (979) 230-3000.